After the recent elections to Legislative Assemblies of some of the states (mainly Uttar Pradesh) in India, some of the defeated political parties are blaming the Electronic Voting Machines (EVM). Their main concern is that the EVMs are not tamper-proof. They cite the claims of some ‘experts’ in EVM technology that even brief access to the machines could allow dishonest election officials or other criminals to alter election results by planting suitable devices inside the machines. These devices, according to them, can be operated remotely (wirelessly) to change the data stored in the machine. Let us think of the situation in some detail, especially with regard to the EVMs used in India. The Election Commission of India is a very trustworthy Institution capable of conducting elections to Legislative Assemblies, House of People (Parliament) etc. on a gigantic scale in a free and fair manner. That is why democracy succeeded in India all these decades post independence. It is true that anything created by man can be tampered. The electronic voting machine as well as the old ballot paper and ballot box are no exceptions. There is no point in arguing that ballot paper and ballot box combination is better than EVMs in this respect. In fact the ballot paper method can suffer easier tampering even in the hands of a layman where as tampering of EVMs requires experts in the field. Those who argue about tampering of the voting machines conveniently forget the fact that the voting machine is under the safe custody of the Election Commission of India. No unauthorised entity can access the voting machine when it is in the safe custody of the Election Commission of India. Then what is the chance of planting any external device in the EVM? In India EVMs are manufactured by two public sector corporations ECIL and Bharat Electronics. These machines do not contain devices that can be accessed remotely (wirelessly). Only those who suffer from delusions can argue that planting unauthorised devices (for remote access and manipulations of election results) in these machines during production is possible. Even if some of the employees in a factory try to resort to such malpractices (the chance for which is nil), this will come to light during the various stages of testing and quality control. So we can rest assured that the EVMs used by the Election Commission of India are tamper-proof due to the fact that there is no chance of unauthorised access to these machines. Voter Verified Paper Audit Trail (VVPAT) is an extra safeguard in EVMs. When a voter casts his vote, the vote is recorded as usual in the memory of the machine. In addition, a paper slip bearing the name and symbol of the candidate voted for is generated. For this a printer is attached to the balloting unit kept in the voting compartment. The paper slip remains visible to the voter for around five seconds through a transparent window (Fig.) so that the voter can satisfy himself that his vote has indeed gone to the candidate of his choice. In the case of a dispute, the paper slips can be counted to verify the result shown by the EVM. Even the VVPAT may not satisfy some candidates ailing from delusions. 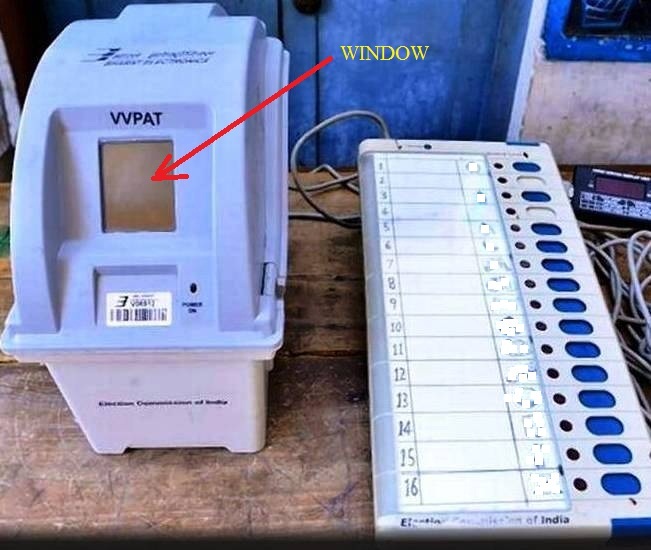 Further, some may deliberately or by sheer mistake on his/her part, argue that what he/she saw through the window of VVPAT fitted machine was different from the candidate he voted for. To avoid such situations at the polling station, I think it will be a good idea to record a video of the voting process inside the voting compartment, keeping the candidates name and symbol along with the finger of the voter that casts the vote in the field of view of the camera. Since the face and the major parts of the voter are not in the field of view of the video camera, the identity of the voter will not be revealed. In the case of a dispute the video record can be used to ascertain the correctness of the result shown by the EVM. The Election Commission of India, ECIL and Bharat Electronics may consider whether this suggestion will improve the utility and reliability of EVMs. I think printers are generally prone to issues. A small low cost video camera similar to security pen camera with the required memory can be easily fitted to the EVM to achieve the required function. We have to use technology to ease our work in all situations. The EVM has been a great relief for the polling and counting officials. We should not even think of reverting back to the old ballot paper method. Instead we should think of improving the security, safety and reliability of the EVM. Since almost all voters in India have Aadhar cards with their biometric data for reliable identification of the voter, the EVM can be designed to identify the voter at the polling station. The Presiding Officers at the polling stations will be greatly relieved since the machine itself will identify the voters using the biometric data and will allow genuine voters only to vote.